As hostilities in Iraq continued to dominate international radio and television, Andrew White's was the voice of authority, always realistic but never without hope. But where is hope now? What is the future for Iraq? This is the fascinating, first-hand account of one man's deepening involvement over six years with a war-torn nation which has yet to find its place in a new order. As an envoy for peace in an increasingly complex situation, Andrew has dedicated himself to religious and political reconciliation in Iraq, risking his life on more than one occasion. He is remarkable for his capacity to relate to people at both a high and a more ordinary level and his picture of life on the ground in Iraq is as compelling as his insights into what goes on behind the political censors. Interspersed in his account are reflections on some of the profound issues that confront him: the nature of evil, the necessity sometimes of war and, perhaps the most urgent question, whether religion is part of the problem or the solution. 'Six years ago Tariq Aziz, then deputy PM of Iraq, invited me to visit the country to see the effect of sanctions. Having started to engage with the religious leaders of Iraq, I became the point of contact between the Coalition Provisional Authority and these leaders after the war. We then started the Centre for Dialogue Reconciliation and Peace, which is the foremost organisation in Iraq for engagement with religious and tribal leaders and the new Government. We work under the patronage of the Prime Minister, and we also have a strategic role in hostage negotiations. 'It is a roller coaster existence in the new Iraq. Ecstasy and despair are part of life. There again, is not salvation history a narrative of ecstasy and despair? Behind the scenes there are real people working day and night to try and ensure that this experiment of rebuilding a rogue nation works. For the people of Iraq, who knows how long it will really be before they see a difference? 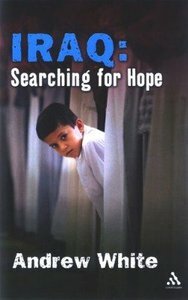 'Andrew is hugely commited to the people of Iraq and his writing has a powerful immediacy. His life has been in danger several times but he keeps going in the most adverse of circumstances. Not only does he relate to those at a high level, but he has befriended orphan children in Iraq and started up a Trust for their benefit. Andrew White, the vicar of St George's Church in Baghdad, has extensive experience with conflict mediation in Iraq and the wider Middle East. President and CEO of the Foundation for Reconciliation in the Middle East, launched in 2005, he has written extensively about conflict resolution and has been involved in many hostage negotiations. He is author of The Vicar of Baghdad. 1. The High-level Discussions And Plans For The Reconstruction Process, And Their Outworking On The Ground; 2. Reactions Of Christians And Religious Leaders In Iraq To The War, The Handover, And The Upcoming Elections In January 2005; 3. The Spiritual Dimension To The War And Its Aftermath; 4. Interfaith Relations At The Cutting Edge; 5. Relationship Between Religion And Politics; 6. Is There Any Hope?